Second only to cockroaches, ants are one of the most common pests found in and around homes and businesses. However, they are much more organized, each with its own assigned duty to ensure survival of the colony. 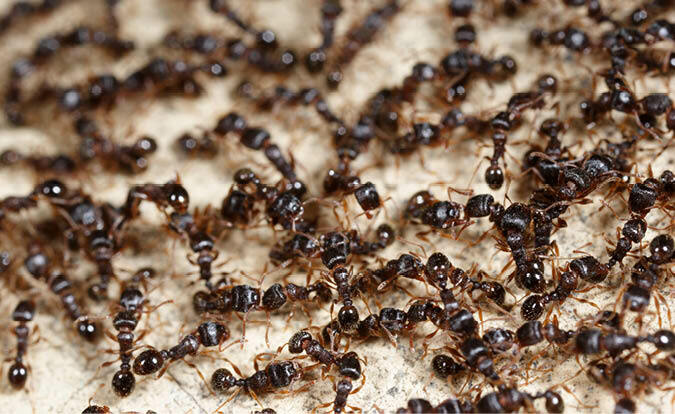 Ants are nearly impossible to treat with over-the-counter products and are best handled by a professional. Like cockroaches, ants enter buildings through openings such as cracks and crevices. They hunt for discarded human food and plant bug excretions, which they take back to their nests to share with other ants. Nests can be found under garden paths, potted plants, inside walls, under floors and in roof voids. Their travels to and from their nests along the surfaces in your home or office can cause dysentery and salmonella. You may be surprised to learn that there are more than 12,000 different ant species. Common species include carpenter, odourous, pavement and fire ants. A colony of worker ants can live up to seven years; the queen up to 15. One of the reasons ants are so difficult to treat is that they create colonies that can number a half million. And they can easily move their nests when threatened to relocate virtually anywhere in and around your home or place of business. Colonies are organized into three castes: female workers, males and queens. Queens are responsible for reproducing and workers for gathering food, feeding larvae and maintaining the nest. Males are responsible for fertilizing the eggs laid by the queen. When ants enter a buildingthey are looking for water and sugary or greasy food particles. As they travel to and from the food source, they leave a scent trail that attracts others to follow. Most over-the-counter pesticides—even those that claim to treat ants—are only effective on the ants that are seen. They do nothing to attack the hidden colony and its nests, making them nearly impossible to treat with over-the-counter products. Ant infestations are best handled by a professionalwith access to products that attack the nest to prevent future infestation.GPS Pest Management professionals are accredited Termidor specialists who provide a 3-month warranty to protect you from further infestation. To ensure your technician provides the most effective treatment, collect a sample of ants, place in a small container and put in the freezer to show your GPS specialist when he arrives. Since ants survive on food particles, keep all surfaces of your home or office as clean as possible. Pet food is particularly attractive to these pests, so it’s important to avoid letting pet food sit in bowls for too long.